We got a huge packet of beef chuck roast for making pot roast late last week, with the intention of making it for dinner on Saturday, and freezing all the leftovers for future meal insurance. Problem is, since last Thursday, our schedule has been pretty packed: dinner with friends on Thursday and Saturday, my mom’s arrival and our last childbirth prep class on Sunday. I thought I could squeeze the roast in on Monday night, even if we didn’t have time to eat it until the next day, but even though I seasoned and wrapped the meat before work in the morning, a doctor’s appointment and an evening vacuum-shopping trip (we got a pretty purple Dyson that laughs in the face of dog hair mountains) ate up all my time and we ended up with fast food instead. It couldn’t wait anymore, though, so on Tuesday, even though my aunt came down from Portland for a visit and I had one last ante-partum meeting with my doula, I made sure to get the roast going as soon as I came home from work. 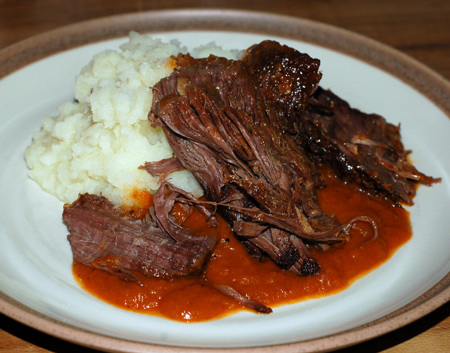 I had quite a bit of tomato juice to use up, so I did a Yankee-style pot roast based on this recipe, originally taken from a Barefoot Contessa cookbook. I pretty much just used the ingredients as a guide and didn’t measure anything out. Rather than letting the meat sit at room temperature for an hour, I seasoned and wrapped it in the fridge for what ended up being a day and a half. Once it was seared and the veggies were sauteed, I poured on that tomato juice and had enough to nearly cover the meat. It went in a 350F oven for 3.5 hours, and I flipped the meat every so often to keep an eye on things. Once it was done, I removed and roughly shredded the meat—which required no more than gently poking at it with my tongs—and pureed the veggies and remaining braising liquid with my stick blender. I’d considered adding potatoes to the pot in the last hour or so, but didn’t want to fish them out of the liquid again for that last step, and mashed potatoes were perfectly satisfactory. The meat was fork-tender, succulent and flavorful, and I thought the gravy was fantastic, but then I’ve always been a gravy girl. 🙂 We’ve got another meal or two stashed away in the freezer now, and while it was in the oven, I was able to take care of everything else that was on my plate for the night: that’s why I love braising! In a small bowl, mix the salt, black pepper, garlic and dried oregano. Rub all of this mixture all over the roast. Cover tightly in plastic wrap and let it rest at room temperature for an hour (or overnight in the fridge). Unwrap the roast and sprinkle the flour all over the roast, patting away any excess. Heat the oil in a large heavy-bottomed dutch oven over medium high heat. When hot, add the roast and sear for several minutes per side, until you have a golden crust on the roast. Immediately remove meat from pan and set aside; add the carrots, celery, onions, paprika and bay leaves. Saute until the onion is translucent, then place the seared roast on top of the veggies. Pour tomato juice over everything until it comes up nearly level with the top of the meat, and cover tightly with lid. Braise for 3 1/2 hours or until meat is tender and falling apart. Gently remove the roast to a serving platter and tent with foil. Remove the bay leaves from the braising liquid and use a blender or immersion blender to puree into a smooth gravy. If desired, pass mixture through a sieve. In the meantime, slice meat across the grain or pull into serving-sized chunks; serve slices of meat with the sauce and some sort of starch and green veggies. Source: Adapted from Armida Cooks.